The Countdown to THE DICKENS PROJECT has Begun! 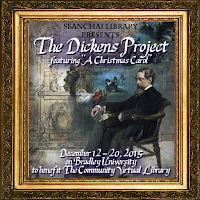 The 2015 Edition of festival known as The Dickens Project is set to open in Second Life on Saturday, December 12th with over 15 hours of live events of all kinds to benefit The Community Virtual Library. 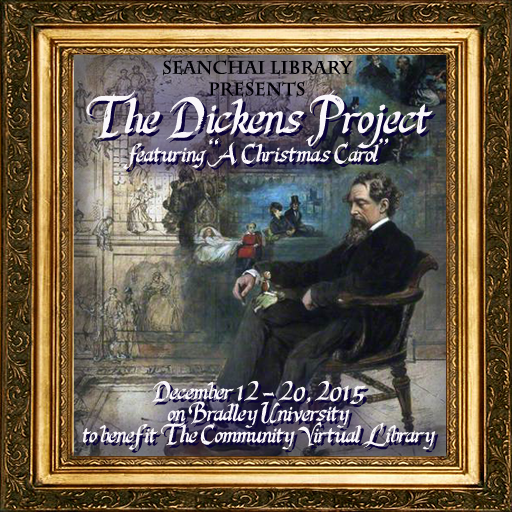 The Dickens Project will take place in the Community Virtual Library’s exhibit space in it's home on the Bradley University Sim. Seanchai Library is producing the festival, opening on December 12th and featuring Dickens’ A Christmas Carol; presenting the different staves (i.e. chapters) of the novella at different times to make the live readings accessible to residents from all over the globe. Other events will include Dickens Trivia, selections from other works of the author's vast canon, caroling by the Raglan Shire Tinie Carolers, and Fezziwig's Ball which begins at Noon on Saturday, December 19th. "Fezziwig’s Ball” will feature two musicians from opposite sides of the "Atlantic Pond." Guests are encouraged to wear Victorian garb, but should not be worried about brushing up on their quadrille or cotillion dance steps. The music will be modern. British Songstress Josie Anderton leads off and Noon with a repertoire that spans the work of contemporary artists, to jazz classics. American Rocker Paul Nowles follows at 1pm with familiar hits from the great rock and roll songbook, and his signature infectious laugh. The finale is scheduled for Sunday, December 20th, a marathon “Big Read” presentation of A Christmas Carol performed in relay style: "all the words of every stave presented in one sitting by a cast of voices." The schedule is currently available on a special page of Seanchai Library's website - seanchailibrary.com. Times and dates are subject to change. Check details at the webpage and at the Dickens Project location (once the festival opens) for the most up to date event information. Events are free to all Second Life Residents, and donations will be accepted for the Community Virtual Library: a registered 501(c)(3) non-profit organization, connecting residents with information resources, reference services, and serving as a networking tool for information resource professionals. The Dickens project will also be accessible from Seanchai Library’s parcel immediately to the east.
" Any ink is good ink, even if it is virtual"